Our number 1 pick for the best bread maker will make delicious loaves in over 14 different ways, whenever you want. 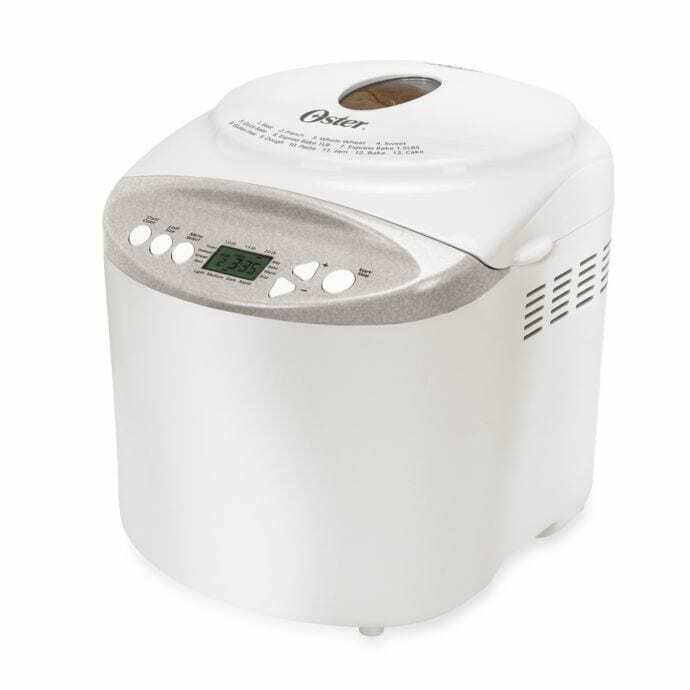 The Oster ExpressBake Bread maker is your best multi-purpose bread maker at an amazing price. Bake up to 34 different recipes including mochi and udon on this high tech bread maker from Panasonic. 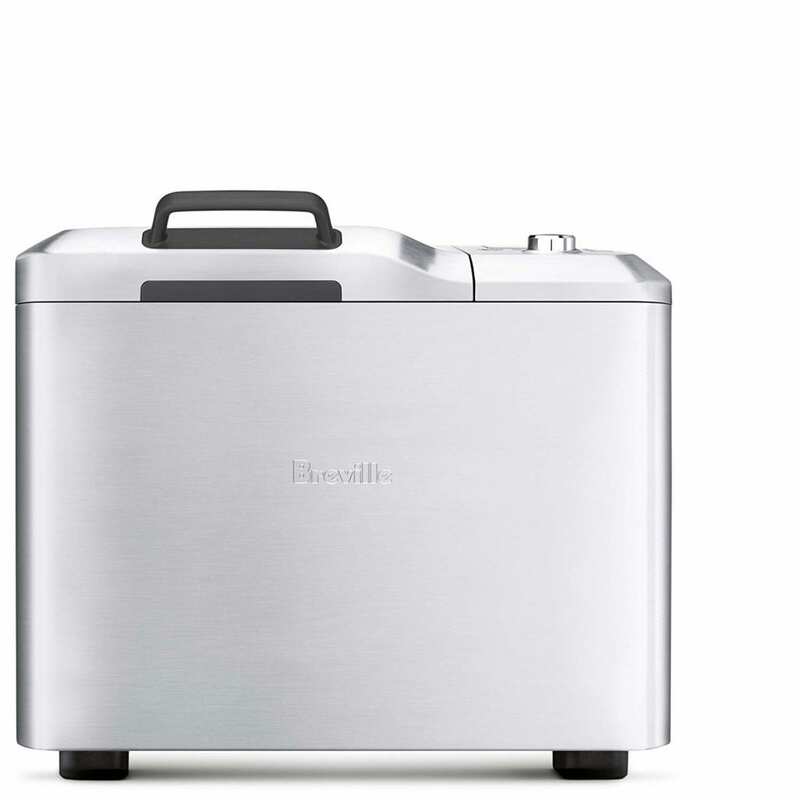 The Breville BBM800XL is perfect for making all types of bread, especially the delicious gluten-free loaf. The Breadman Professional Bread Maker is the best value for families and bakers who love to experiment. Tired of the taste of store-bought bread but don’t want to go through the trouble of making bread from scratch? If you’ve ever tried to make bake bread at home then you probably know the tedious detailed task it can be. Making the perfect loaf of bread requires a lot of expertise and patience, and let’s face it, some of us just aren’t natural bakers. But that doesn’t mean you can’t enjoy a freshly baked loaf of bread from the comfort of your own home. 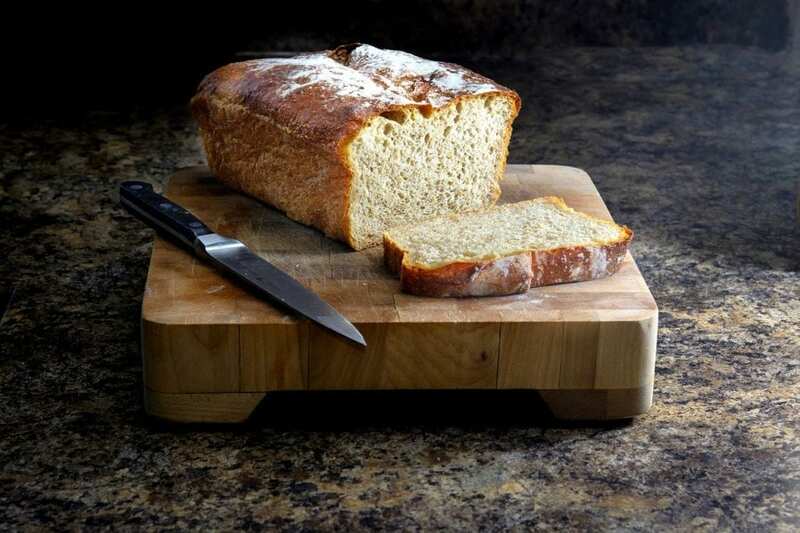 If you’re enthusiastic about homemade bread then investing in one of the best bread makers may be just what you need. A bread maker is an extremely useful kitchen appliance that can serve you and your family well once you know how to use it. The bread machines on the market nowadays are packed with tons of features that make them a versatile household appliance, and they don’t only make bread! Bread makers today can make loaves in all shapes, sizes, and varieties. No matter what your favorite type of bread is, you can make that easily by using one of the best bread makers from our list. Before we dive into the ins and outs of bread makers, check out our picks for the top brands. There are plenty of great bread machines out there, but one of the best bread makers is the Zorijushi Home Bakery Virtuoso Plus. The Zorijushi will give you brown, fluffy loaves of bread every single time. If you’re a dedicated homemade bread maker, then you’ll be happy with the Zojirushi’s programmable settings, knead paddles and other top-of-the-line technology that makes the best bread. The Breadman Professional Bread Maker is an all-around great option for making the perfect loaves of bread at home. This stand out bread machine comes with a collapsible paddle so that your loaf doesn’t have any holes in it. You’ll get 80 recipes, a collapsible measuring cup and measuring spoon and even 14 programmable settings to choose from. This Breadman bread maker is also one of the best values out there because of its affordable price. For almost half of the cost of the other bread maker’s, you’ll get the same perks. When it comes to dietary restrictions, it’s important that the quality and taste aren’t compromised when enjoying our favorite foods. The best bread maker for people with gluten intolerance will be delighted to try a loaf of the Breville BBM800XL bread. What’s great about it is that you can adjust the crust settings, the loaf sizes and customize your bread to your liking. For gluten-free bread, the machine calculates the timing for you so that your bread will come out just right. Try it out and if needed, tweak a few things to see how you can get your recipe just right. 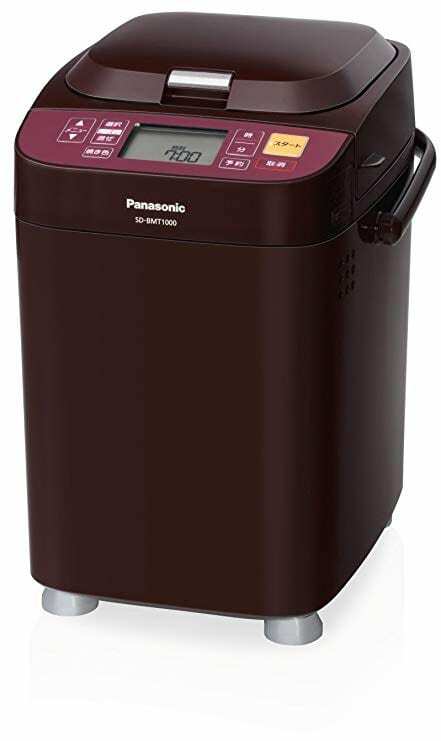 Most bread makers come with around 10+ programmable settings so you can make several delightful treats but the Panasonic SD-BMT1000 goes the extra mile and makes up to 34! Do you love to experiment and make things like Marble bread with special ingredients? Well with this powerful machine, you can do that and more. 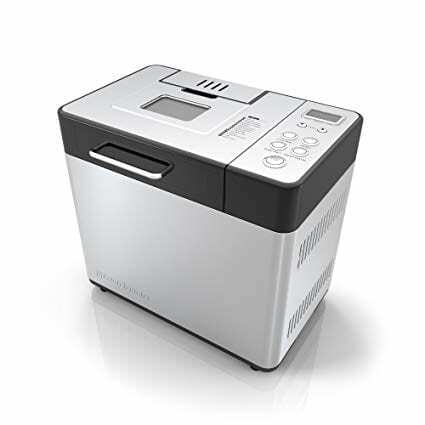 The Panasonic power bread maker is imported from Japan and comes with over 34 programmable settings available. In the bread machine market, that is an insane amount of settings to choose from, including Japanese treats like udon and mochi. For the serious bread makers out there who are looking to go the extra mile, the Panasonic SD-BMT1000 pushes the boundaries and will make you a loaf you’ve never even dreamed of. The Oster ExpressBake BreadMaker is an all-around catch when it comes to making the perfect loaf of bread. This bread machine is loaded with several types of features so that you can make it to your liking or change it up whenever you please. It’d be perfect for you or your family to enjoy and the Expressbake setting gets you a loaf in under an hour. The machine is great for someone who wants to make a variety of bread, doughs and even jams because of its 13 range of settings. 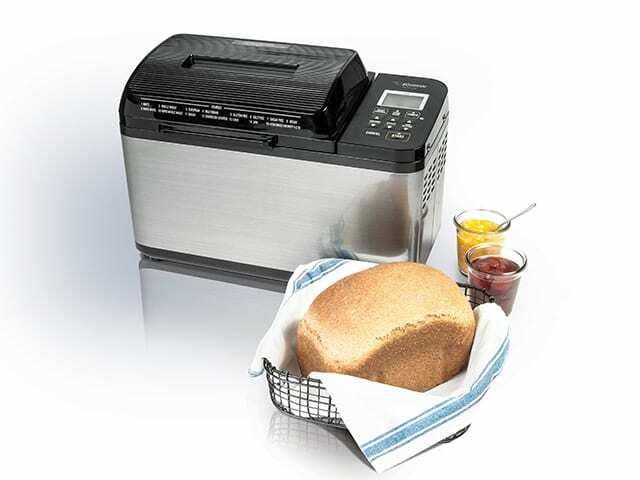 You can also play around with the crust colors and the size of the loaf with this bread maker. 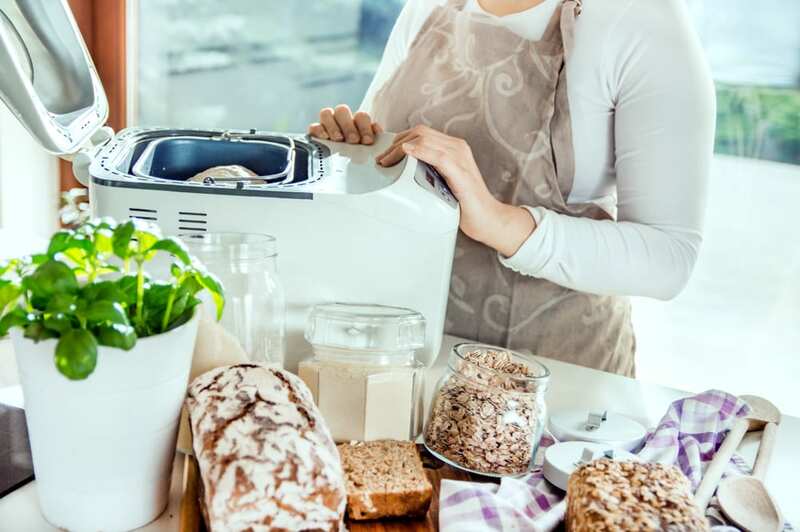 Now that you’re closer to finding the best bread maker, let’s break down exactly what you need to look for when it comes to finding a bread machine. There are plenty out there on the market, and like anything, not all are created equally. Bread machines tend to vary when it comes to the product design, the type of bread it makes and the programmed settings available. Depending on the kind of bread you’re trying to make and the level of bread making skills you have, you may want one from the other. Here are a few things to keep in mind when it comes to shopping for bread makers. As you can see, bread makers all have different designs and features. 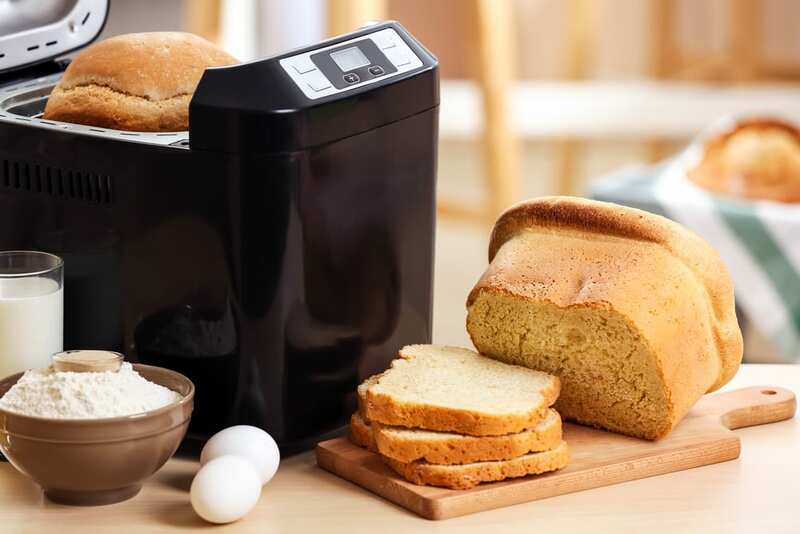 Familiarize yourself with a few key parts of the design of a bread maker so you can make sure that the appliance you’re investing in is reliable. A typical bread machine is shaped like some sort of rectangular capsule, although the shape varies from brand to brand. On the outside of the machine, you will usually find the screen where you have your programmable settings, timer and on some machines, buttons for the types of bread you can make. The best bread makers have a sleek, straightforward design that makes it easy to use. Here are some of the main parts of the design to pay attention to. The inside of the bread maker is where the magic happens, your bread maker is essentially going to do all of the work for you-including kneading the dough. You’ll typically find the kneading paddles on the inside. Every bread machine has a different type of kneading paddle, but most should come with one of two. The kneading paddle should the kind that can properly knead the dough by reaching all parts of the batter. It should be up to par with kneading by hand. We recommend looking for bread makers with two paddles if you want one that will thoroughly get the job. Another feature to look for is a removable kneading paddle, this is important because you may not want the paddles to leave a hole in your bread. The kneading paddles should also be nonstick so that your bread can be easily removed once it’s done. Essentially, the kneading paddles are a big part of how your bread will turn out. Most machines will have a viewing window at the top of the machine so you can monitor your bread as its baking. This is important because you can always keep an eye on the progress of your loaf of bread and can stop it if you want to adjust anything throughout. The best bread makers will have a wide enough viewing window to see most of the loaf. One of the best bread makers features that you need to look for is the heat distribution. Nowadays a lot of bread machines come with a heated lid like the Zurijushi Home Bakery. This is important because it keeps your bread heated and cooking evenly on all sides, ensuring a more fluffy consistent texture throughout. The heaters are also important for the browning of the bread. For the bread makers out there who are concerned about aesthetic just as much as taste and texture, this is something to look out for. Another feature to check for is the dispensers, which are built-in areas where you can add in extra stuff to your dough. Maybe you love your bread with some walnuts and berries baked into it, well adding these into your bread maker is possible. If you choose a bread maker with built-in fruit and nut dispenser, then you can add them in in the beginning and not worry about coming back to it later. This is extremely convenient and cuts down on the amount of time you spend monitoring your bread. Likewise, many bread machines come with a yeast dispenser in it as well. The machine times out the exact moment to add in the yeast so that the bread rises properly. If your bread maker doesn’t have these dispensers, it will notify you when to add in these ingredients according to the programmable options. The goal is to bake a loaf of bread that looks similar to one that you’d find at a store, but much tastier. The loaf shape and size are extremely important when it comes to your bread maker. The best bread maker will create the perfect loaf of bread in the size that you want (1 lb, 1.5 lb or 2lb). While the size can vary depending on the machine, most people want an even height and width all across. Check out the reviews for different bread makers to see if they bake even loaves. Sometimes, if a machine has only one kneading paddle, the bread will have a strange shape where the slices are unusually tall. Keep this in mind when choosing a bread maker if the shape is important to you. Additionally, the loaf sizes depend on the machine. It’s easy to find a bread maker that makes several types of loaf sizes, ranging from 1 lb to 2lbs. If you have a larger family and plan to make bread often for the household, opt for a machine with a larger loaf size. If you are in a smaller household and want the option to make smaller sizes, choose a pan like the Oster ExpressBake Breadmaker, which has 3 different size options available to choose from. Nowadays bread makers can do much more than just make bread. Bread machines are powerful versatile machines that can make all sorts of things and have plenty of ways to make it. Because of the access, it’s best to choose a bread maker with plenty of settings to choose from. Don’t spend too much on a bread machine that only makes a limited type of bread, or only has one timer setting, for example. Bread machines are all about convenience, and the number of settings should give you that. Pre-programmed- You’ll see this word thrown around a lot when it comes to bread machines. Pre-programmed settings refer to the different types of things you can make with the bread machine such as wheat, sugar-free or even gluten-free loaves. It is standard to see a bread machine with over 10 different settings. Once you start adding more and more settings, that’s when the price goes up. The bread machines with even more settings can make things beyond bread. Programs include dough, cake, sweet bread, no-knead bread, and other programmable options. This is especially important for seasoned bread makers if you know you want to skip a step or prolong a certain option, then choose a machine that has plenty of options. Gluten Free – A high number of bread makers are people with special dietary needs. Getting a bread maker allows you to customize your bread to fit your dietary needs, like gluten-free. Nowadays almost all bread makers have a gluten-free setting which makes delicious bread that will taste like normal bread. The instructions will tell you exactly how and when to add in certain ingredients so that you can enjoy delicious slices of bread at home. The great thing about a bread maker is that by making the bread at home, you can save money on the often-overpriced gluten free bread you’ll find at the store. Crust Color- The color of the crust has a lot to do with a loaf of bread’s texture, but really it’s all up to preference. That’s why it’s important to invest in a bread maker that gives you the option to adjust the settings, and that usually includes crust color. The crust color options are usually from light to medium to dark. The main point of a bread machine is simplifying the bread making process. So your bread maker should be as simple to use and understand as ever. Most bread makers come with an instruction manual so that you can begin using it in no time. If your machine is imported like the Panasonic one, then this may be a bit difficult to begin using since the manual is in Japanese. Besides this, most bread machines come with an accessible manual and several bread recipes with clear instructions on how to program the machine. Another indicator of a machine that is easy to use is whether or not it is clear where the bread is at in its cycle. You should be able to glance at your bread maker to tell and you should be able to know when to add in extra ingredients by an alarm. Bread machines are expensive devices that unfortunately do wear out over time with use. Just like any appliance, something could go wrong that could cause your device to malfunction. It’s rare, but there are random reports of a bread machine giving out after a couple of uses. In this case, you’ll want to make sure you get a brand that comes with a warranty so that your device can be replaced if this does happen. Most companies come with a warranty of 6 months to a year but check each brand review to see the specific time for each.